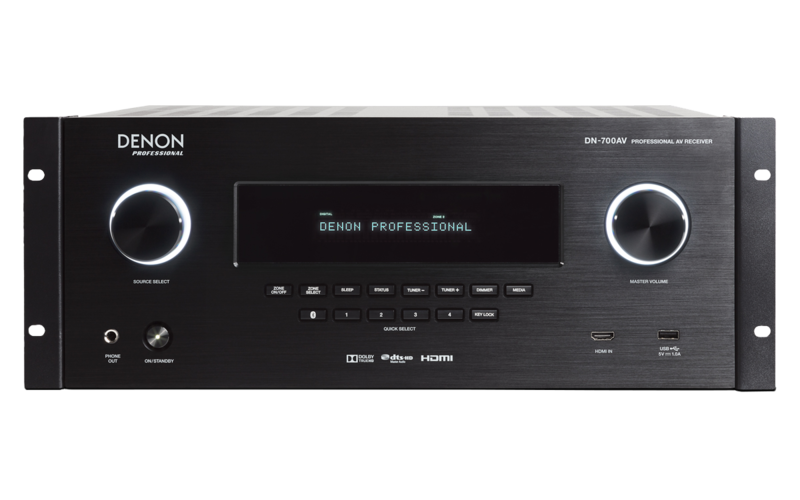 What is included with the DN-700AV? What are the main features of the DN-700AV? Can you play files from your USB Flash Drive? What kind of Inputs and Outputs does the DN-700AV have? How do I connect my Bluetooth Device to the DN-700AV? Can you send RS-232 Commands Codes into the unit? How do you Connect to the Network? How do I setup my Quick Select buttons? What does --- mean when selecting an input source? Is this unit Rack Mountable? What are the main features for the DN-700AV? Can you play files from a USB Flash Drive? Yes, you can connect a USB flash drive to the USB port of this unit to play music and picture files. Only USB flash drives conforming to mass storage class and MTP (Media Transfer Protocol) standards can be played on DN-700AV, in the FAT16 or FAT32 format. The supported file formats are WMA (Windows Media Audio), MP3 (MPEG-1 Audio Layer-3), WAV, MPEG-4, AAC, and FLAC (Free Lossless Audio Codec). 1. If DN-700AV is off, press the Power button to power it on. 2. Connect your USB flash drive to the USB port. NOTE: The USB flash drive must be in a FAT16 or FAT32 file system format in order for the DN-700AV to read the files. 3. Select Multimedia as your desired media type and use the cursor left and right buttons on the remote control to select USB. 4. Select a file from the list displayed on DN-700AV or your TV/computer monitor. To move through audio files or folders, press the cursor left and right buttons on the remote control. Press Enter to open a folder or to select an audio file to begin playing. The DN-700AV comes with an array of inputs and outputs on the back of the unit that allow you to connect to a range of devices like televisions, Blu-ray players, and surround sound speaker systems. If DN-700AV is powered off, press the Power button to power it on. Use the Source Select knob to choose Bluetooth. Proceed to your Bluetooth device’s setup screen, find “DN-700AV” and connect. Note: If your Bluetooth device prompts for a pairing code, enter 0000. Begin to play music on your Bluetooth device. To disconnect a paired Bluetooth device, press and hold the Bluetooth button for 3 seconds. Alternatively, use the Source Select knob to choose another playback source and disconnect pairing. Can you send RS-232 Commands code into the Unit? Yes, you will be able to send RS-232 command codes to the DN-700AV to control it, without having to use the buttons on the unit. You will need to connect to the Serial Port: This input lets you connect a host device (usually a computer) to the DN-700AV. You can use the host device to control DN-700AV via commands using the RS-232C serial communication. You can connect to a network by using the LAN Port that is located on the back of the DN-700AV. From that LAN Port, you will connect to the modem of your router. By using the network, you can play music files stored on a computer or from Internet radio stations via your network (LAN). By setting up your input sources to the Quick Select buttons on the DN-700AV remote control, you will be able to quickly view, or switch different input sources you have connected to your unit. To select from the input source options, rotate the Source Select knob on the front panel or press one of the Quick Select buttons. Use the Source Select knob to select any input source. Press and hold one of the Quick Select buttons for two seconds. The selected source will be stored in the Quick Select location. This means, that the Input that you have selected cannot be assigned to the source. You will want to make sure that the input number is the same number HDMI input you put into the back of the unit. For example, you have a HDMI cable plugged into input number two, and you select the input source as one you will see it appear as "---"
You want to make sure that whatever input being used is assigned correctly within your DN-700AV input assign.